Just a few miles down the interstate from Grandma J is the second oldest city in the universe including the planet Melmac United States.....namely San Antonio, Texas. 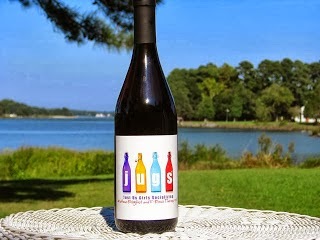 St. Augustine, Florida is the oldest, along with all the old people who live there...maybe. 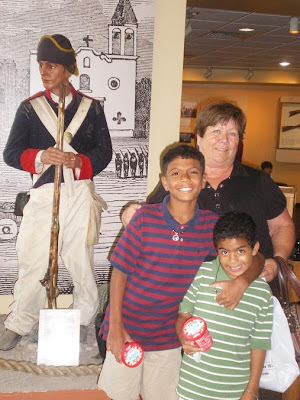 Now, Grandma J loves taking visitors to San Antonio, and share some of the wonderful historical and cultural sites. 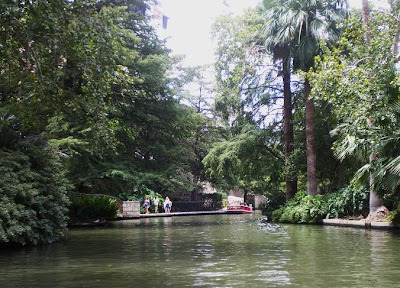 So, of course, her grandsons had this venue high on their list of places to see...because one of them visited San Antonio when he was three years old, and couldn't wait to return, and share the experience with his brother. This picture was taken from the Riverwalk tour boat. There are two natural rivers, The Guadalupe River, The San Antonio River and some man made stuff that run through the city of San Antonio. Coincidentally, they envelope a mall.....something Grandma J considers divine intervention. Here is another shot from the boat tour. Along with plush gardens, several historical buildings, museums, and Hooter's line the walkways. Oh, and of course the mall and a zillion hotels and restaurants. 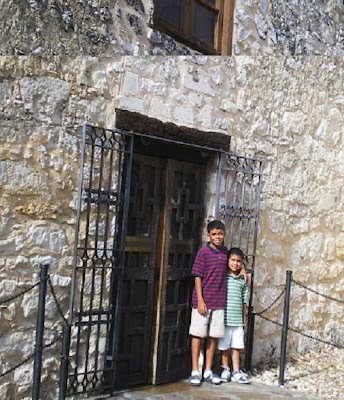 The boys couldn't wait to get to the Alamo....and it was our first stop in San Antonio, even before the Riverwalk. Grandma J and the boys enjoyed two informative, historical presentations. One out in the courtyard by someone who has a very vivid and detailed account of the battle at the Alamo, and the subsequent defeat of Gen. Santa Ana by Sam Houston. The second presentation was held in the original long barracks. It was a slide presentation mirroring the oratory in the courtyard, with air conditioning. Grandma J took this photo of the boys outside the long barracks, which is where all the Texianos died, including Jim Bowie and Davey Crockett, King of the Wild Frontier. Because it was hot outside, and Grandma J wanted to get over to the mall.....some pictures were taken in front of artificial backdrops....like this one. And of course a trip isn't complete without a photo op with a statue of one of Santa Ana's Mexican soldiers......in the lobby of the IMAX theatre in the mall. Does Grandma J look like she's been through the wringer or what? We can't let a visit to Texas pass us by without exercising our freedom of doing whatever we want while the parents are a zillion miles away! For everyone! Well, almost everyone. 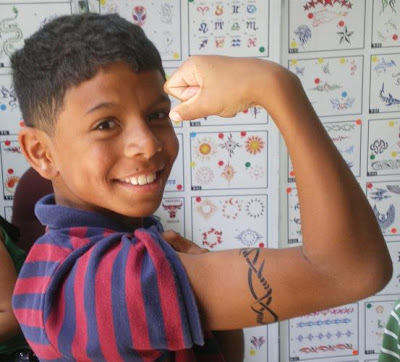 You could at least humored us with a crab tattoo! Come on GJ! Looks like the boys are having a ball! And you look like your feet hurt! Love ya and I am proud that you can hang! Those are some handsome dudes btw! Looks like you are having so much fun!!! I have always wanted to go to San Antonio! I'm jealous. Hooters? My favorite place...I like them naked with medium hot sauce. When I come to visit, let's just go to the mall and forget the hot and sweaty stuff. You did an excellent job of tour guiding us through San Antonio. Now I want to visit. What?! No tattoo for you? It looks like the boys are having a good time! Aww! you mean you didn't get a tattoo? Oh well! You're adventurous enough I guess! Yup. Walking all over San Antonio would constitute adventurous! no tattoo for you? I am dissapointed a wild thing you! Where's your tattoo. I am sure you all are having a great time. The boys look like they are up for everything. Having fun with GJ! 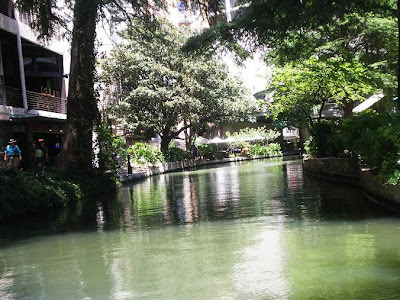 First of all, I love the photos of River Walk. I've flown into San Antonio 3 times but never got to see it because I was always high-tailin' it to Bandera to see an ex-father-in-law who probably still lives there in an RV drinking bourboun from a flask every day. There's no doubt in my mind Grandma J. got a tattoo - it's either of Gustav or a fiddler crab. I guess I'll have to wait and see for myself when I drag my mother out to visit her sometime this winter. My Bob and I love The Riverwalk. We've been there twice when each of our sons graduated from USAF Basic Training. We also toured some of the historic homes. Loved them, too. Your boys are darling. What a great grandma to have such fun with them. Oh fer goodness sakes, one more reason not to send my kids to TX without me. Coincidentally, we just had a talk about tattoos tonight. 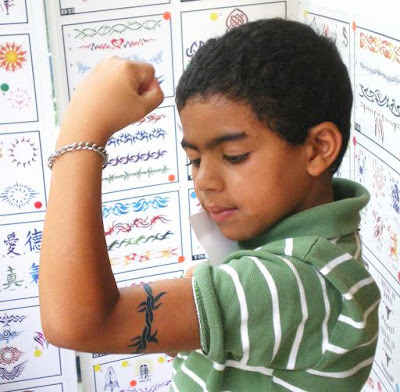 Many of their friends on swim team wear "temporary tattoos" or just plain old write on themselves for the swim meets. We chatted about how the ink can go into your bloodstream, which is not safe. Finally, the most important point of all...if you have a tattoo, you cant donate blood! Glad the boys are having such fun! GREAT STUFF grandma j!! 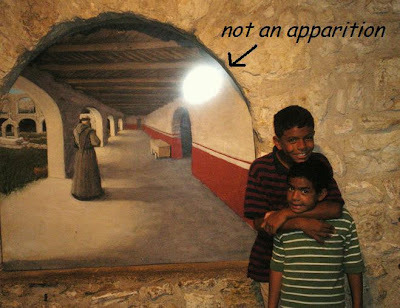 i myself need to visit the alamo one day. did they show you the spot where ozzy ozbourne peed on it?... no tatoo for you? What a wonderful Grama, Grama J!!! Bet your grandsons love visiting you. If Audrey comes to the Alamo with Grandma J, will she get a tattoo too? That would be so cool. Looks like J's crew is having a blast. Love seeing all the pics. The more I hear about San Antonio, the more charming it becomes! I had the pleasure of attending a conference in San Antonio several years ago -- my first visit to that great city. I really enjoyed it. When I got out of my car at the LAX parking lot, I realized I had left my suitcase at home! There was no time to make the hour-long round trip to Pasadena, so I arrived in San Antonio with absolutely no clothes (except the casual attire I was wearing), underwear, toiletries, you name it. The concierge at the hotel told me about Dillard's Department Store, which we don't have out here in L.A., but I must say that from the moment I walked in and explained to the nice lady what had happened, she had me all suited up and ready to roll in no time. Among the many pleasant memories of San Antonio, I certainly will never forget that one! Last time I was in TX the 1968 HemisFair was in San Antone! I went there and to the Alamo...and I still have a little stuffed monkey my Great Aunt bought me at the Alamo. Looks like you are showing the boys the time of their lives! Dig those tattoos...I thought maybe you would be sporting the one of Grandma J on your arm! That would be cute! Snow White will be flying out to TX at Way Too Early O'Clock tomorrow. Next time, I'll have to INSIST that she take me along.....I really want one of those tattoos!!! They LOVE their fake tatoos! Z's is wearing off a little, by T's is going strong. They had so much fun and miss you already.